CurrencyFair is a low-cost way to do international money transfers. I first wrote about it when researching how to transfer money to European P2P lending sites. CurrencyFair charge a fee of €3/£2.50 to transfer out money, is generally free to transfer in money, and a 0.25% or 0.3% fee on the currency exchange itself. CurrencyFair claim that around 10% of their transfers actually beat the interbank rate. This is because the matching is done internally on a peer to peer basis. Here are a couple of tips to help you get the best possible exchange rate when using CurrencyFair with an example I did earlier today. Just start a new currency exchange as normal by clicking on ‘Exchange’ under ‘Transactions’ on the left hand tool bar. In a similar way to the newbie RateSetter trick, CurrencyFair will automatically try to match you on the best rate currently available on the market. However, if you click on ‘Choose your own rate’ on the right, you can set a better rate for yourself. Once you click on ‘Choose your own rate’ it opens up with a historical chart of previous matches. More interesting if you want a quick match is to look at the ‘Exchange Queue’ tab. Again, a bit similar to how RateSetter matches borrowers and lenders it shows you the ‘sellers market’ listing who currently is looking to sell in your currency pair, the amount and rate. The automated exchange rate given by CurrencyFair was 0.824 British Pounds for every Euro. 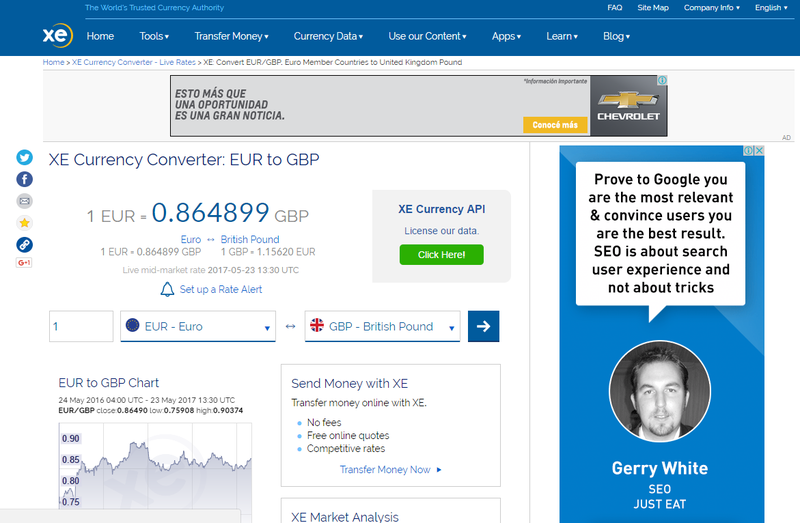 As I was doing a EUR -> GBP exchange and wanted to get the most pence for my cents, I pushed the exchange rate up to 0.8636. I set it at this level because there was a large 440k EUR sum waiting at 0.8636 and I didn’t want to wait for that to shift. After setting up the exchange at the slightly higher rate, it was matched within 2 minutes. On my test amount of €165 this gave an extra 20p. This all adds up if you are doing multiple exchanges or for larger amounts. If you want to try it for yourself, CurrencyFair are currently offering a new customer offer which gives a €30 bonus after your first €1,000 transfer via a valid CurrencyFair referral link. This first transfer is also free (usually £2.50), so you are only paying the exchange commission of around €2.50-€3.00. If you use my CurrencyFair referral link we would both get a €30 bonus for this. At the time I did the exchange above, Xe.com gave the real exchange rate at 0.8649. So once you factor in CurrencyFair’s exchange commission this is not a trick to make money by beating the market, just a way to cut down transaction fees when necessary. The exchange rate of Currency Fair is worse than Transferwise (fees included). Maybe there are also tricks within transferwise to choose your own rate, I haven’t looked closely.